Would smarter marketing affect the election result? With the opening of the polling stations in hours not days now, I have been reflecting on how the political candidates have been targeting me in Richmond Park and North Kingston. As the photograph above shows I have been bombarded with a range of leaflets over the last few weeks, and from all the candidates, as I am sure most of you have. This tactic is very much a traditional marketing approach, but what else could the parties have done, using alternative marketing channels, to influence my vote? I am aware that some of the parties have also knocked on our door, but I have been away working for the last few weeks, and in any case the visits have mainly been during the daytime and so would have missed me. Doorstep politics is used, as I understand it, to target marginal wards. So I guess there is some logic to continuing this - but there are other ways that the parties could have used their limited resources in more effective channels. We are after all in the digital age! 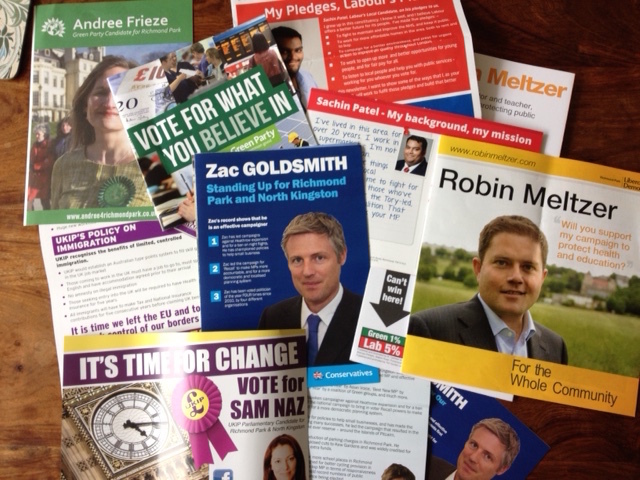 Saying that, I have received personalised mailings from the Conservative and Lib Dem candidates, the former due to the fact that I joined Zac Goldsmiths email list to follow what he was up to, as my existing MP. I have also received emails from the LibDem candidate. These two parties are effectively the only runners in my area - so I guess the other parties may just not bother, but are they missing a trick? I am fairly active on social media but I have not been "reached" by any of the political parties on this channel. This is somewhat surprising as we have seen how whole movements of political change have been started and co-ordinated through this platform. Anyhow maybe all of this is academic, as do people really change their mind at the last minute? In my view the the parties, like brands and services, would be better working on their longer term brand and loyalty building, rather than just relying on short-term tactical interventions. So in answer to my own question, "would smarter marketing affect the election result?" I would probably say "yes" but maybe not this time round! Thank you for reading this post. If you find it interesting please share it or post a comment. My business, www.pamah.org, is a new and exciting strategic marketing consultancy, based in Kingston upon Thames, which exists to help individuals and organisations reach new heights. With over 20 years of experience in marketing we want to help you "spread your wings" and achieve your targets in a fun and dynamic way. 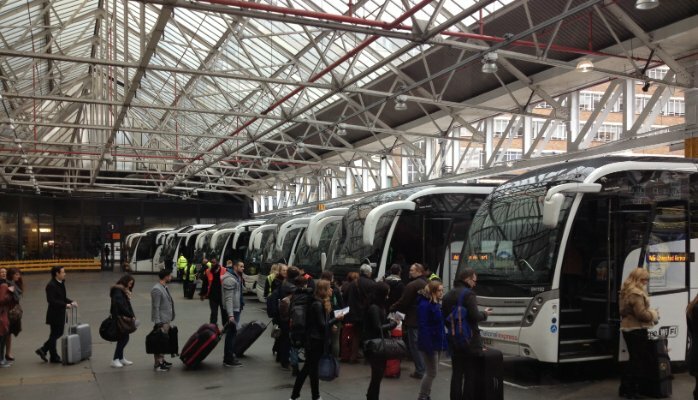 When I told people that I was going to get the coach from London to Folkestone, to visit my parents, the reaction was generally one of surprise. First I was asked if I was feeling okay and then I was reminded that "coaches are for old people and students". I was even offered the use of a Lexus for three days by some well meaning relatives. Now to be fair for the last 30 years or so I have always driven down to the coast, but I decided that I would give the coach a chance, and at £5 for a single journey it seemed like an attractive alternative - at least financially! So how did the coach fair? Well I was promised leather seats, wifi (on some journeys) a toilet and an electrical charge point for my gadgets. Unfortunately only the first of these was actually available. However I did have some additional items thrown in that were not really journey enhancing, including pigeons at Victoria coach station and a 15 minute delay. On the positive side the booking process online was seamless, the driver was both courteous and helpful (even loading and unloading baggage for those of us brave enough to be separated from our possessions). Time-wise the driver did manage to catch up a few minutes but at just under three hours from our scheduled departure I decided to check out the competition for the return journey. So here I am sitting on the hi-speed train and I only have 55 minutes to write this blog - a huge saving of over two hours in terms of journey time! This is a major plus but obviously comes at a cost financially - after online booking fees it's a shade under £30 for a super off-peak single. Also there's still no sign of wifi or an electrical socket and I'm not up for looking for a toilet for fear of losing my table seat. So I will revert to driving for my next visit, especially as my wife will be with me and so the car will once again win on time and price. A shame really as I'm sure that more people would use "public transport" more for leisure trips if it better met customer needs in terms of price, time and additional services. How about train journeys at coach prices? Now that would be interesting! 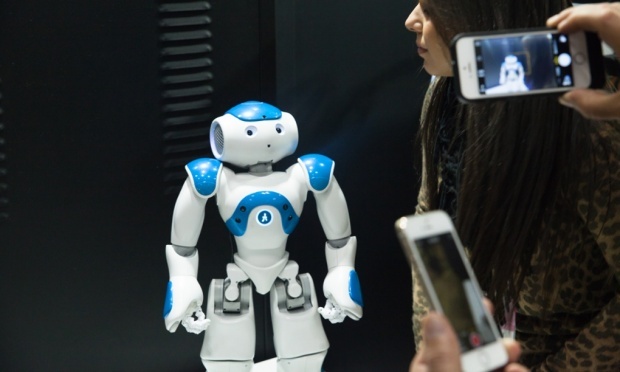 Can robots provide better customer service? As I sat in the audience at Somerset House last weekend (#startup2015), listening to three former Apprentices, I reflected on the last series and wondered what I had actually learnt. First to speak was Melody Hossaini, who managed to overcome the fact that her slides had not been loaded into the presentation, and so had to speak from her notes. Nonetheless she gave a very passionate speech about "believing in yourself". Lesson 1, young people not only have lots of energy, they often have supreme confidence. Nothing seems to faze them, even failure. They just find another way! Solomon Ahktar was next, having arrived late and in the most ridiculous trousers, which to be fair he did apologise for. All that Solomon had on him was his famous mobile phone, on which he had tapped in a few prompts. He gave a short and meandering speech which was punctuated with humour, pausing to pose for the camera whenever anyone raised their mobile phone. But it was clear that this man is an ideas man and someone who is not afraid to look foolish in communicating his ideas - hence the trousers I suppose. Lesson 2, we should never be afraid to suggest new ideas or ways of doing things. I'm sure most of us realise that for every 10 ideas only one has to count to make a big difference. Finally, it was the charming Felipe Alviar-Baquero. Now in my mind he was the true winner of the last series. He didn't disappoint either. His advice to the many start-up business entrepreneurs present was delivered in a very calm and collective manner. It was both inspiring and sensible. Lesson 3, the best candidate can often be overlooked but will always continue to shine through. Fans and customers - the perfect recipe for success! Is it a bus stop queue? Are they fans or customers? I've started reading the book "Fans Not Customers" by Vernon Hill, the founder of Metro Bank UK and Commerce Bancorp in America. The basic principle is that competitive edge comes down to service and if customers become fans then they will help create yet more fans. So far, this formula has worked magnificently for Vernon, with year on year growth in the banking sector, at a time when other banks are struggling. So I decided to visit my local Metro bank in Kingston upon Thames and what a refreshing experience it turned out to be, more on that later. It also got me thinking about some of the other "brands" I had experienced in the last few days. Now I am a big fan of Graham Norton and I was absolutely delighted to see the live recording of his show last week with guest stars Benedict Cumberbatch, Timothy Spall, Miranda and Maroon 5. Once inside the studio the experience was a joy, the show ran like clockwork, Norton was superb, funny, extremely slick and professional. However the pre-show experience was very poor by comparison. Despite having pre-registered for tickets we still had to queue for 90 minutes and even then we were lucky to get in. We were also fortunate in that it was both warm and dry. The process can at best be compared to a poorly run raffle at a village fete. It actually included a man shouting out ticket numbers and colours in an inaudible fashion! So while I remain a "fan" of Graham Norton and a "customer" of his show, I am unlikely to recommend others go through the same experience. So back to the Metro Bank tour that we were treated too today. All the staff were refreshingly helpful, we were greeted in a large open reception that looked more like a hotel than a branch. We were told that we could open an account within 15 minutes and that we would walk away with our debit card. We were shown the vaults, offered the free use of a meeting room and a customer toilet! I am most definitely a fan and will probably be a customer very soon. As we walked home it started to rain and we passed what we thought was a queue of people at a bus stop. It turned out to be a queue of parents who had driven their children to an entrance exam at a top performing school. I wondered how Metro Bank would treat these potential "customers". Surely they wouldn't expect customers of their bank to queue outside in the rain. Now we could all learn something from that approach! I received an interesting and "special" email from the charming Martin Lewis this week. Special, in that it warned that the email was being sent out very carefully, as "telling 9m people at once risks putting a strain on the UK ticket system". Interesting, in that finally there was some good news for the consumer in terms of getting cheaper train tickets. Initially I enjoyed reading that the new TicketySplit tool "takes on the ridiculous train ticket pricing anomaly that means buying two separate tickets sometimes costs less. It can save some regular travellers £1,000s". But I then got to thinking, why was there a need at all for such a tool, surely it should already be easy to buy the best value tickets, through existing channels! But here is the very genesis of what is wrong with the current fares and ticketing system. The increased competition of the rail operating industry has created a complex system of ticketing that no longer makes sense to the consumer. It seems that rather than competing on train service reliability and punctuality, train operators are competing on price and how to make the whole process of ticket purchase confusing. How many times have you sat on a train and wondered how much the person opposite you paid for their journey? Worse still why is it that people with the best bargains repeatedly broadcast this news to the rest of the carriage! Maybe we should ask the lovely people at the BBC to do a "BBC Price of Transport study" to follow up on their highly interesting "BBC Sport's Price of Football study" (launched today). Not only would we know how much a pie costs at White Hart Lane or AFC Wimbledon (where sadly they either do not have pies or refuse to reveal their prices), but we could also know how much it costs to get to all the football grounds by all the various options. But then again there is now at least Tickety Split! 50 and never too old for new tricks? I was at a 50th birthday "wild hog" celebration last week, golfing at Celtic Manor, home of the Ryder Cup in 2010. Things certainly got off to a "wild" start, as in the excitement of meeting up, we somehow managed to tip a whole jug of hot coffee over the birthday boy. Rather than worrying about any burn damage to his leg, his main concern was whether the coffee stain made it look like he had "shat himself", not the best look for someone just turning fifty! Anyhow, the inevitable reminiscing that occurs at events such as these, got me thinking about how things have changed since I started working. It is hard to imagine now, looking back, how businesses functioned without digital technology such as computers and smart phones. Gone are the typing pools, the handwritten messages, and the rabbit warren like offices. I was also, recently, at an Enterprise Nation event for small businesses hosted at Microsoft's smart and shiny offices in Victoria (London). At this event, amongst other things, we were given an excellent book by Dave Coplin, Chief Envisioning Officer for Microsoft UK, entitled "The Rise of Humans - How to outsmart the digital deluge". The theme of the book is all about the need to take back control from this digital development. Although my favourite part, of the book, was actually the reference to Charles Handy's five elements for a great portfolio career, which also shows how work, or more precisely careers, are changing. According to Handy, success is achieved by getting the right balance between: paid work (your day job); fee work (for specific products or services); gift work (e.g. charity or community work); home work (family time) and finally study work (learning and development time). So far I have managed to achieve four out of these five, since setting up my own business www.pamah.org in 2012. Anyhow, for the record, on the golf trip, we stayed up drinking in the hotel bar to way gone 11pm, and we didn't complain that much on the whole trip, apart from our demise on the golf course. Wild hogs indeed! At the height of rush hour the gates to the Tube are closed at Victoria as too many people try to enter the system. My first experience, for nearly two years, of rush hour commuting into London, co-incided with Sir Peter Hendy stating that "London Public Transport Will Cause Riots If It Doesn't Improve". (http://www.huffingtonpost.co.uk/2014/09/22/london-public-transport_n_5859770.html) So what had gone so wrong? Or had I just forgotten how bad it was getting? As you can imagine, I approached my early morning journey with some trepidation. I decided to walk to the train station, rather than fight my way onto a bus already laden heavy with school children. Rioting with school children thus neatly avoided! My time waiting for the train was spent wondering whether I would get a seat near the window, to provide some ventilation on a particularly muggy September morning. In the end I was already too late for a seat and had to stand for the entire journey. As we left each subsequent station, the train got fuller and fuller, and the temperature began to rise accordingly. I once read that each person emits the same heat as a light bulb while travelling on a train, but the man opposite me was certainly emitting more than this, after the girl in-between us accidentally spilt coffee all over his newspaper and grey trousers! This little incident didn't cause a riot either thankfully, but it did serve to remind me about the time I once sneezed a trail of snot onto the overcoat of a man sitting next to me - luckily he took it very well in the circumstances, although I had to get off at the next station to avoid further embarrassment, even though it wasn't my stop! So, as the train steadily filled up, I tried to work out what was different and why a riot was being predicted. I noticed that there were more bearded men than before, that people still dressed in drab grey outfits, that nobody communicated other than to shout out things that station staff used to say, "can you all move down a bit please". And then it struck me! There was just more people per se! And these people were still all travelling en-masse at the same time of the day. So what about those "soft" demand management tools, such as encouraging businesses to stagger hours of working? What about the predicted rise of people working from home? After all, hadn't these measures worked so well for the 2012 Games? I travelled home at 15:30, had a choice of seats, had room to balance my tablet, coffee and newspaper and as a result, had no stress, compared to my morning commute. So my suggestion? Well it's radical, but still "soft" and involves the use of one of the founding members of the marketing mix 4 P's - price! Until fares are adjusted significantly to make the differential between peak and inter-peak travel a real option, I think people will continue to fight it out for a seat (or a standing space). You can increase capacity ("hard" measure) and that will make a difference in the short-term, but I firmly believe that a more radical approach is required, to get people to change their travel behaviour. People may then be rioting at their businesses, fighting to get them to change their working hours so they can change their travel times, rather than rioting on the transport system. So, I also predict a riot, but hopefully one that starts to solve the problem and change the way people behave! A local (my Dad) standing outside "Something & Son - Amusefood. Fish, chips and mushy peas - staple meal of Folkestone's amusement arcades. This experiment places the whole cycle of production, cooking, eating and recycling waste on one school site". Folkestone Triennial 2014. 30th August - 2 November. I left Folkestone in 1981, but have been back regularly to visit family ever since. My most recent visit, however, was to experience the Folkestone Triennial, now in its' third season. Folkestone like many other seaside towns has been struggling since the Victorian days to re-establish an identity. The loss of domestic tourists ripped the heart out of many towns like Folkestone, and it has taken a long time for most of them to re-act to the drop in tourism income and the inevitable and sad rise in unemployment. Folkestone looked like it would benefit from the opening of the Channel Tunnel in 1994, but apart from job creation, not to be overlooked, the tunnel merely established Folkestone as the place that millions of people passed through (a bit like me when visiting my family). There was also the loss of an area of countryside to contend with, a lovely area where I used to play freely as a child. Again the high speed rail link promises to bring more wealth to the seaside town, especially with the drift of people leaving London for cheaper housing, albeit with fast commutes back to the capital for employment. But at least they will be spending some of their cash in Folkestone. But what of the identity of Folkestone? What of the vision for the town? What is its' USP? (unique selling point) in marketing jargon. Well that's where the Triennial comes in, as part, as I understand it, of a master-plan led by the former Saga chief Rodger De Haan. Now there is a reason to visit Folkestone again, to appreciate and debate art. But that is only the start of it. Like re-branding a product or indeed person (after all isn't that what the popular culture of celebrity TV show is all about) it is vital that the target market (sorry more marketing jargon) get to see and sample the new offering and in doing so the opportunity to see the bigger picture. In the case of Folkestone, the Triennial opens the door for people to see the wider potential of the town, as it embarks on a major regeneration programme, with art and culture at its' centre - not forgetting references to the past e.g. good old fish and chips! It must be working as people such as Yoko Ono, Tracey Emin and Mark Sargeant are now part of the Folkestone message, there are reviews in the London Evening Standard about the triennial and the trendy new restaurants, such as Rock Salt. Even people at my golf club, back in Surrey, are aware of the gold buried in the sand as part of the Triennial. So while the locals look a bit confused about some of the art pieces, and some even debate the point of it all, I say well done to the organisers of the Triennial and to Roger De Haan for sticking to a master plan - great art, great town plan and fantastic marketing. Lookout here comes Folkestone! While travelling recently through South East Asia, what struck me most in countries like Laos and Cambodia, was that while the poverty and lack of wealth was clear to see, you could nearly always get a good WiFi reception. This was true if you were in a small city like Phnom Penh and even a tiny village off the Mekong River. This is not always the case in developed countries and certainly not true of London. Try, for instance, maintaining a link while travelling on public transport. The minute you go underground, you lose the signal on the Tube, there is very little Wifi on buses and mainline trains. The only place you can get a decent signal, other than in the offices or public buildings, are the coffee shops, but you have to wait for one of the many students to finish their never ending bottles of water, before you can get a seat to plonk down your flat white and iPad! So this got me thinking, with the announcement earlier this week, that Apple is finally getting into wearable tech, with the launch of the Apple Watch some time in 2015. How ironic that the Apple Watch will probably work best in countries like Laos, where the locals can least afford them! Although, I wonder how long will it be before you can buy a fake Apple Watch in the stalls of many of the markets in South East Asia? Meanwhile, back in London, everyone (including me) will be eager to be seen to be wearing the new tech, while dashing into coffee shops to check their messages!